Having the proper headgear is very important for any wrestler as it provides vital ear protection. 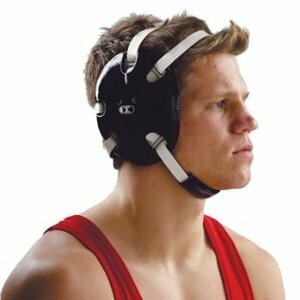 Since wrestlers are constantly hitting their heads on the mat, it is very important they have the proper headgear to avoid injuries like cauliflower ear. This happens when the ears get hard and out of shape due to repeatedly hitting the mat. Schools require that each wrestler wears the proper head gear to avoid injury. If you want to buy the proper wrestling headgear then there are some easy to follow methods that you can use to ensure you are properly protected while wrestling. Be sure to measure your proper head size so that you know which type of wrestling headgear to buy. You can ask a friend, family member or your coach to help you determine your head size. You can always ask your wrestling coach where to purchase the appropriate headgear. He will be in a good position to give you good advice on a particular brand or the different places where you can buy some good quality headgear. Make sure you ask any questions that you might have regarding the proper way of wearing your headgear. Talk to your teammates as some of them must have recently purchased some headgear. Be sure to ask them the brand, style, cost and which store they bought it from. Your teammates are a good source of valuable information when it comes to wrestling headgear. Go to your nearest sports supply store and find the wrestling section. Here you will find a huge selection of good high quality headgear. Be sure to ask the salesperson for help when it comes to the different styles or brands available. Also, make it a point to check the prices so that you can compare with online stores. Go online and you will find a huge selection of different websites dedicated to wrestling supplies. Make sure you visit websites that are reputable as you will probably be using your credit card to make a purchase. Compare the different prices of wrestling headgear and make sure that if you decide to purchase one that you get the correct size. There are few different accessories that you can buy with your head gear which include a chin cup and hair slicker. It is up to you if you feel that you need the accessories as they are optional depending on how long your hair is and the type of protection you want for your chin.